It must have seemed like a good idea to have bring the original American production of "Picasso at the Lapin Agile" to Toronto with its original director and a Canadian cast. That is, it would have seemed like a good idea about five years ago. But comedian Steve Martin's 90-minute comedy premièred at Chicago's Steppenwolf Theater in early 1993 and it is now late 2001. Most major cities in North America have either seen a version of the Steppenwolf production or have mounted their own, and that includes the two main regional theatres in Ontario. Theatre Aquarius mounted its own production in January this year, the Grand Theatre (co-produced with the Vancouver Playhouse) back in 1998. Being the original production has a certain importance, but it does not necessarily mean that it is the best presentation of the text. I saw the Grand's production in 1998 and can aver that it was superior in virtually every way to the version now playing in Toronto. Martin's play, set at the Parisian bistro, the Lapin Agile, in 1904, presents an imagined meeting between the young Albert Einstein and the young Pablo Picasso. One year later Einstein would publish his Special Theory of Relativity; three years later Picasso would break from his "Blue Period" with "Les Demoiselles d'Avignon". Martin is obviously working in the recent subgenre of "what if they met" drama inaugurated by Tom Stoppard's "Travesties" in 1974. Martin is not as clever as Stoppard in form or content, but then how many popular American plays are there that concern the relation of art and science, desire and achievement, fiction and reality-and are still funny? There are two sides to Steve Martin. Most people know him as the "wild and crazy guy" who most often appears in mediocre film comedies. Fewer people know that he is serious collector of modern art and former student of philosophy. 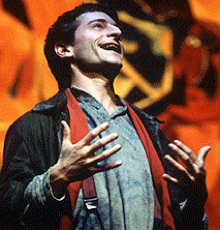 The Steppenwolf production directed by Randall Arney relates "Picasso" only to the popular side; the Grand production directed by Peter Hinton related it to the other. Arney's approach is to treat the play as a 90-minute sketch, to turn all the lines into gags and thus to gloss over the many intriguing philosophical points Martin makes. Hinton's approach treated the play as a play, found humour in character and situation, and thus highlighted Martin's philosophical points to make the play intellectually interesting as well as funny. Arney's version may have been the original one, but to my mind Hinton's was richer by far and far more satisfying. It's too bad the Canadian Stage did not have the foresight to present the Grand's version four years ago. Admittedly, Scott Bradley's detailed set and Patricia Zipprodt's period costumes, both enhanced by Kevin Lamotte's lighting, are much more elaborate than those at the Grand. But Arney relies on them alone to create the atmosphere. Hinton had the cast's interactions create the mood of an artistic community resident at the café. Arney, however, has no interest in ensemble and makes the cast seem like a pack of competing stand-up comics. One sign of Hinton's attention to detail that he had Einstein use a German accent and Picasso a Spanish one, while Arney doesn't bother with either. It does not help that the cast CanStage has mustered is largely inferior to the one at the Grand. Geoffrey Bowes as the owner Freddy gives the impression throughout that he is running a Western saloon not a Paris bistro. Cara Pifko plays Suzanne, Picasso's latest conquest, and two other women. She makes Suzanne seems more like a pert schoolgirl rather than the world-weary woman of the world she should be with the result that her delivery never matches the sense of what she says. Eric Peterson's Gaston, an elder habitué of the bistro, is simply a caricatured old man. Under Hinton Gaston's frequent trips to the loo showed him reluctant to be torn away from interesting company; under Arney they are perfunctory and pointless. Worst of all is Jordan Pettle as Picasso. He simply doesn't have the poise or command of gesture and diction to bring the part off. His Picasso seems to come from New York not Spain and shows none of the charisma that would explain why so many women fall in love with him. Alon Nashman is far better as Einstein. The quirky self-confidence and sense of humour he give the part makes him an appealing character, although doesn't quite catch the sense of Einstein as a genius the way David Storch did at the Grand. Both Nashman and Pettle suffer under Arney's failure to make clear that we are meeting Picasso and Einstein before they are famous. Arney presents them already as celebrities contrary to the text, undermining the humour of their various anachronistic remarks and missing the irony that the fictitious Schmendiman is at the moment supposedly the most famous person in Paris. All the remaining roles are well taken. Michelle Fisk (Freddy's wife, Germaine) is the only cast member able to situate her character in the time and place of the action. Only when she speaks do we get the sense that a great century has passed and an exciting new one has begun. William Webster gives the small role of the art-dealer Sagot more character and vitality than Pettle gives Picasso. Ron Kennell makes the supposedly famous inventor Schmendiman suitably bizarre and Blaine Bray is super as the Visitor from the future whose identity I won't reveal since it is meant as a surprise. This is not the first time I have felt that an American director did not mine the richness of an American text as fully as a Canadian director. One need only compare American William Carden's shouting match of "Who's Afraid of Virginia Woolf?" this year at Stratford, versus Michael Shamata's far more subtle version at the Grand in 1998 or American Vivian Matalon's routine "Our Town" for Stratford in 1991 versus the Joseph Ziegler's more complex version for Soulpepper in 1999. In each case the American director, as in "Picasso", has conceived of the play in terms of star turns and fulfilling generic expectations while the Canadian has thought in terms of ensemble and conflicting modes of drama. Arney presents "Picasso" as a simplistic laugh-riot. This ultimately insults the author's work, the actors' abilities and the audience's intelligence. Photo: Jordan Pettle as Picasso. ©2001 CanStage.